Porter Cable and DeWalt are registered trademarks of the Stanley Black & Decker Corp.
Bosch is the registered trademark of the Robert Bosch Corp. If there is a sleeve size that is not listed above, call and tell me what size you need and if I can get it made for you I will. I'll call you within 2 days and let you know how much it will cost, if anything beyond the standard $13.00 and how long it will take to get it to you. If you buy a chuck and sleeve, I will ship them together so you have only one shipping cost, and remember, what it cost me to ship is exactly what you pay -- no more than the cost to me. If you go by one simple rule, your chuck should last a lifetime. The chucks we sold in 1993 are still in use today. 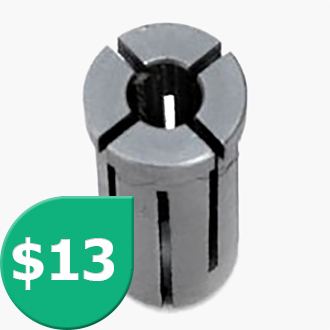 The one simple rule is this: The only way you can damage the chuck is to OVERTIGHTEN it. If you over tighten it you can bend the screw (the screw will not break) it is high tensile steel, but it can bend if turned with Super Man force. The screw does not have to be tightened with such force. You take the T handle allen wrench and turn, when you see it is tight you give it a small bit of a turn and that is all it needs. We stand behind our product with a lifetime replacement guarantee. If for any reason the chuck fails, you can just call me at 703-644-4188 and arrange to send me the chuck for inspection. If it is not damaged except for the screw being over tightened, I’ll fix the chuck with a new screw and a new cam and you will get it back as good as new. 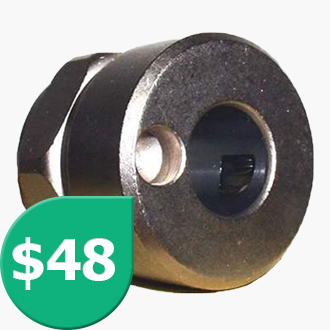 You pay for the cam and screw, approximately $5.00, labor and shipping for a total of approximately $25 to $30 and you have a chuck good as new. If you follow the one rule you might never have to call me, but if you do, you will be well taken care of. You have only one person to deal with and I’ll call you back the same day or at most the next day. J. P. Walsh and J. L. Marmo Enterprise Inc. invented and patented their first quick change chuck for a router in 1990. Patent Number 5,096,212. It was called the EZchuck. In 1993 we manufactured and sold approximately 1,000 chucks. On December 25, 2001, we patented a new design and got a Patent and changed the name to the Eliminator Chuck™. The new Patent Number 6,332,619 B1 is owned by J. P. Walsh & J. L Marmo Ent. Inc. We have sold over 20,000 from 2001 to the present without very much advertisement and with at least 99% customer satisfaction rate. Call me directly (703-644-4188), FAX me or send me an email. When you call me please have your VISA or MASTERCARD information available so I can process and ship your order the same or next day at the latest. If you FAX me, (703-569-2394) please include on your purchase order your contact information so I can call you for the appropriately billing information and to confirm your order details. If you email me, (JoeLMarmo@aol.com) I check my email daily so I can contact you and process your order same day or next day. I normally make all shipments via Priority Mail. If you want first class mail that is not a problem and remember you pay only for the actual cost of shipping -- no handling charges. Boxes are amply sized and your items are well-protected. My office is in my home, so you can call or fax me any time (24/7) and I will respond to you as soon as possible. "...it solves the bit changing anguish dramatically." "I’d like to make this sound more complicated but it really isn’t." "It certainly has reduced the expletives coming from our shop!"